Enjoy this children's production of wooden puppets boxing until one is knocked out, however the puppets don't appear to be responding to their commands right when they are put in. 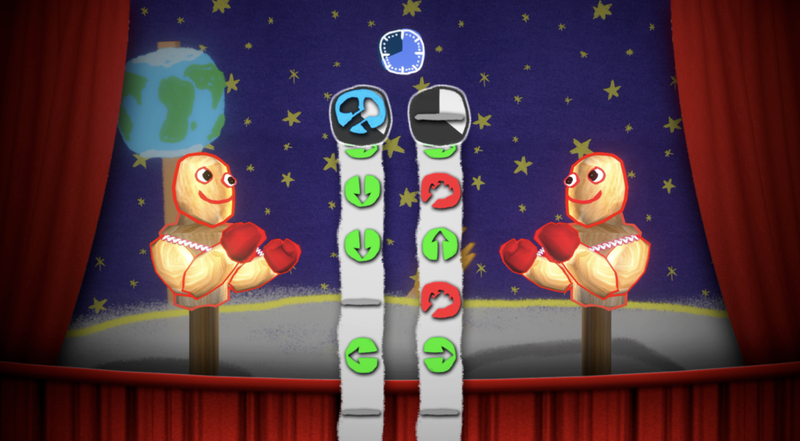 Punchy puppets is a fighting game where you don't fight in real time. Submit your input to the puppet, and watch it execute your commands. Can you outsmart your opponent in the rapid-fire mayhem mode? Can you fake out your opponent in the tense strategy mode? Can you just punch your opponent in the face? You'll have to wait and see. Play against the CPU or grab a friend and duke it out! Welcome to Spaceport Babel. Our spaceport features a wide range of amenities, services, and comforts to make your travel more enjoyable. Disclaimer: We do not offer human translations for our signage. You cannot get refunds for missed flights. This is not a game, but an experience. Explore and get lost in an alien spaceport. Try to catch your flight.